When Greg Stang first came to PeopleService a decade ago, he brought to the table a vast depth of knowledge acquired from his many years in Public Works. He is well versed in the issues and problems that most city officials and workers face every day. He understands. He speaks their language. “I know what it’s like to be on the other side of the equation. When a client has a question, an idea or a problem, they want a clear, concise answer – and they want it now. PeopleService embodies an expansive network of expertise and it’s my job to deliver the answers and solutions they need. 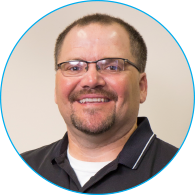 Every interaction with a client is an opportunity to impress.” Greg knows that our clients expect results and he is laser focused on providing great service. “Our reputation is everything. You do great work and the word spreads. When you really care about the people you work with and for, good things happen. What has made PeopleService an effective service provider across the Midwest, will now, on strength of reputation, expand our services into North Dakota.” Greg is enthusiastic about his work, but he isn’t all business. When he’s not on the job he enjoys deer hunting and motorcycling, and most of all, he loves spending quality time with his family. Learn more about Greg and connect today.